Last Thursday the first Dutch Raspberry Jam took place at the Ordina HQ in Nieuwegein. I offered to do a presentation slash demonstration about realtime audio and the the Raspberry Pi so I promised myself to be there at least an hour before the scheduled starting time of my demo. That way I could also join Gert van Loo‘s presentation. When I arrived at 19:15 there was no Gert van Loo though so that should’ve triggered some alarms. Also I didn’t look out for members of the organization as soon as I came in. Instead I chose to dot the i’s and cross the t’s with regards to my demo. About half an hour later the event was closed. I approached the person who closed the event and introduced myself. He replied that they thought I wasn’t coming anymore. Apparently they misinterpreted my e-mail I sent earlier that day that I didn’t manage to produce something workable for the laser show guy. They took it for a cancellation. But immediately the event got kind of reopened and I set up my stuff. We had some audio issues but in the end everything went quite well actually. I showed off what is possible with a Raspberry Pi and realtime audio with the use of some of my favorite software. Guitarix featured of course. I grabbed my guitar, fired up guitarix on the RPi and played some stuff. Hooked up my MIDI foot controller and showed how to select different presets. I also demonstrated the use of the RPi as a piano with the help of LinuxSampler and the awesome Salamander Grand Piano samplepack and did some drumming by using drumkv1. Before the realtime audio demo I presented an overview of the Linux audio ecosystem and talked about the alternatives of how to get sound in and out of your Raspberry Pi. These alternatives are not bound to the onboard sound and USB, since recently it is also possible to hook up an external audio codec to the I2S bus of the Raspberry Pi. I got one in myself this week, a MikroElektronika Audio Codec PROTO board based on the WM8731 codec, so more on that soon. It’d be awesome if I can get that codec to work reliably at lower latencies. So it all turned out well, I had a great time doing my presentation and judging by the interest shown by some attendants who came up to me after the presentation I hope I got some more people enthusiastic about doing realtime audio with the Raspberry Pi and Linux. So thanks Ordina for offering this opportunity and thanks everyone who stuck around! 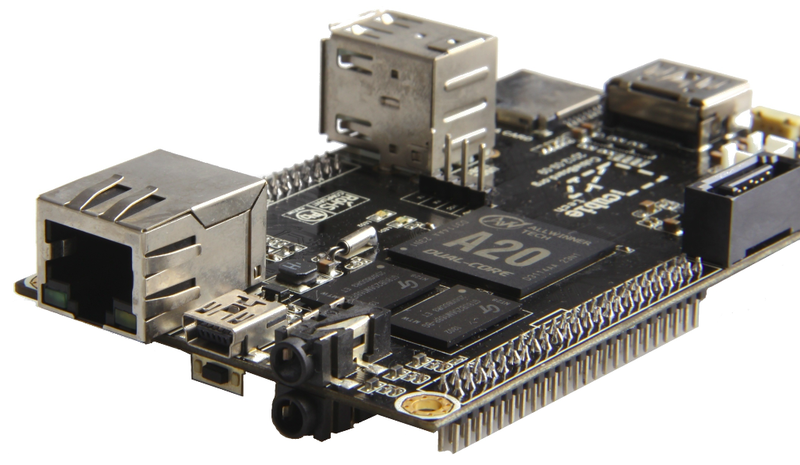 Exit BeagleBone Black, hello Cubieboard2! Put up my BeagleBone Black for sale. It was gathering dust, somehow this board doesn’t appeal to me. Biggest drawback is that it seems to be very picky with power adapters. If you don’t use a linear power adapter USB devices might not work properly. And that was exactly the issue I was facing, I just couldn’t get my USB audio interfaces to work on the BBB. So I lost interest because well, that’s what I bought the device for, to get sound out of it with the help of an USB audio interface. Add to this that there is no realtime kernel or RT patchset available for the BBB and that the BBB is quite a complex little device (it’s actually a REAL dev board). It would’ve cost me too much time to completely fathom it. No bad feelings though, the BBB is a very nice product and it sure has the slickest looks of all ARM SoC dev boards around. Also I got a Cubieboard2 in recently. And that board has absorbed me for the last week and a half. It’s quite easy to set up (not as easy as the RPi though), has a lot of IO (yes, it has audio in and out!) and it blows both the RPi and BBB away when it comes to performance with its dual core A20 Allwinner SoC that can easily be overclocked to 1.2 GHz. Alas, no realtime kernel or RT patchset either but hey, I managed to get a RT kernel running on a Rockchip RK3066 based device so I could at least give it a try. And it worked out well. I’m now running a 3.4.61-rt77 kernel on it with a custom Debian Wheezy installation. This time I used git to keep track of the modifications I made so it was a lot easier to create a usable diff. I also patched the driver for the onboard audio codec because the hardcoded defaults were just unusable for realtime audio. Minimum number of periods was 4 and minimum buffer size was 1024. Don’t ask me why. So I’ve changed these to 2 and 16 respectively and managed to get JACK running at a respectable -p64 -n2 -r44100. Fired up some JACK clients and this little monster keeps up very well. USB audio interfaces are no problem either, I can run my Edirol UA25 in Advanced mode with -p64 -n3 -r48000 without any hitch. This is probably because the Cubieboard2 doesn’t use a Synopsys DesignWare OTG controller with out-of-tree dwc_otg drivers like the RPi but a better supported USB controller. At the moment the Cubieboard2 is the nicest ARM dev board I have laid my hands on so far. The first Dutch Raspberry Jam will take place on Thursday September 26 at the Ordina HQ in Nieuwegein. I’ve offered to do a presentation about doing real-time audio with the Raspberry Pi which has been accepted. Internet visibility of this event is minimal at the moment though, let’s hope it caches on. This Saturday my series of workshops about music production with open source software will kick off. The first workshop will be an introduction to the open source ecosystem and attendees will get acquainted with some basic Linux audio principles; different work-flows (monolithic vs modular), ALSA/JACK/PulseAudio, most used and most useful applications and maybe a bit about plug-in frameworks (LADSPA/DSSI/LV2/VST). I will also outline the content of the following workshops and this workshop is a gauge to see if there is enough interest. So people should show up in considerate numbers because I’m not going to invest another 5 Saturday afternoons for just a few people. After all, I’m doing this for free (as in beer).